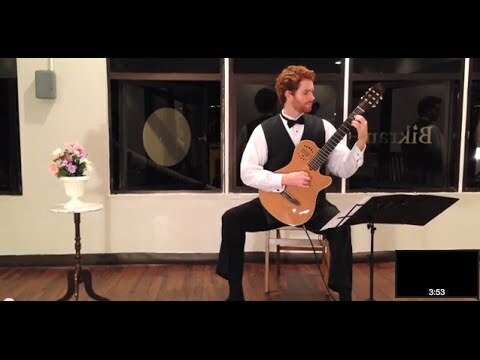 Add a touch of excellence to your event with the beautiful sound of the classical guitar. Stephan Kane is experienced in providing professional guitar performance services for weddings and events. From classical to contemporary and Hawaiian, his music will enhance any special occasion. Reserve with Stephan today and create a wonderful atmosphere for your upcoming event. Stephan was great to work with. Would recommend for a dinner party, cocktail hour, or a wedding. Stephan Kane was great! His performance was the highlight of the event. Many of our customers already asked me to have him back at our next event!! Stephan Kane played for the reception after our family Memorial Service yesterday. He is very professional and a superb musician. He was easy to work with, has a wide repertoire of pieces from which to choose, shows up on time with all necessary equipment, and is a delightful presence. His music provided the perfect atmosphere for the event. It is a pleasure to work with someone who is so talented, yet understated and, indeed, humble. I would not hesitate to recommend him. Stephan is so awesome. He was helpful in establishing the set list for our wedding-- I am not the kind of bride who had this all planned out in advance (no wedding book, no bride dream list, nothing), so his prompting enabled me to put it all together. We were of course stressed to the max and running late on the big Wedding Day, but he was able to collaborate with the groom to get everything set up and ready for the ceremony. Not only is he friendly, approachable, and professional, Stephan is such a talented musician and his acoustic guitar playing really made our moment on the beach what it should be: magical! We even invited him to our rehearsal dinner! I found Stephan Kane on Gig Salad while browsing for our Wedding Musician. I was looking for someone affordable, reputable, personable, a little rustic, and talented (of course!) - Stephan was all of those things! I was a little wary of hiring someone on Gig Salad without meeting them first so I asked Stephan to meet my fiancé and I at Starbucks. The meeting went great! He answered tons of questions, made me feel at ease, and showed us samples of his music. It was a no brainer, we HAD to have him at our wedding! Stephan is also very flexible with his music. He gave us a list of songs he normally plays but also said if there was a song we absolutely loved, he would learn it! I thought that was such a generous offer! We ended up sticking with selections from the list he gave us and I was very specific: this song for the bridesmaids, this song for me down the aisle, this for the kiss, this for the walk out..etc. On the day of the wedding everyone was late due to unexpected traffic (and he was very apologetic afterwards) but all that mattered to me was that he was there before me and he was so no worries Stephan! We started the ceremony about 45 minutes late due to the traffic and Stephan was nice enough not to charge me for the delay. The ceremony went great. He played everything beautifully and followed my specific instructions. We received tons of compliments about him afterwards! I highly recommend Stephan for your musical needs! Our day wouldn't have been complete without him! His music added a special quality to the wedding. Stephan is personable, approachable, professional and a talented musician. Our events schedule changed several times and Stephan remained flexible and accommodating. He learned 2 new songs for us and performed them beautifully for the wedding ceremony and at the reception. As well, his services are very reasonably priced. Thank you, Stephan, it was a pleasure to meet you and your music made our special occasion even more special! Stephan is an incredibly talented musician, and charming young man. I completely trusted him to make my daughter’s wedding ceremony exactly what she wanted – very unique and special. I gave him a list of some special songs and a general idea, and he magically made it happen. These were all pieces that were completely non-traditional that he had to acquire and learn! I cannot express to you how amazingly perfect his performance was; timing, skill, intuition, and beauty. I'm not sure if there are many events that receive such detailed planning attention as do weddings. When my son and future daughter in law asked me if I could find a classical guitarist for their mid-summer outdoor wedding, I was thrilled to be assigned a specific role and to help. Stephan Kane came to us with strong recommendation. He exceeded our expectations from the first moment. At the bride's special request, Stephan was asked to play "La Valse d'Amelie" for the processional. I had heard the piece previously arranged for piano and for orchestra but never for guitar. Stephan created an arrangement for guitar especially for the event. He decided he required another musician to be satisfied with his work and made those arrangements as well, without concerning us. Given that the event was outdoors and the procession stretched a goodly distance, timing the processional was part of the challenge. Stephan did that beautifully. Additionally, he provided lovely selections of his choosing as the guests assembled, appropriate amplification equipment, and executed both set up and break down of his equipment expeditiously and discretely. Stephan was politely responsive to my emails, communicated well and completely, and did for us everything that was expected and more. To me and to many, live music enhances any event. Working with a wonderful musician like Stephan, who is, as well as talented, gracious and humble, makes adding the magic of live music to the ambiance an easy decision. You walk into a beautifully decorated room or out along the beach…You hear sweet sounding guitar music being performed for your guests. You detect the delicious aroma of cocktails and appetizers you’ve specially chosen for them. Everything just feels right! I specialize in performing beautiful solo guitar music and will help you make this an event to remember. Stephan Kane is a classical guitarist from the sunny windward shores of Hawaii now living in San Francisco. His music is sought after for his inventive arrangements of pop and Hawaiian music for the solo guitar along with interpretative performances of the standard classical guitar repertoire. Stephan's playing has been described as “…embodying the passion of Spain” and having “… great sensitivity and lyricism.” He was a member of the Ashland Guitar Quartet, lead guitarist in a popular local reggae/rock band, and has been the principle guitarist in various musical productions, including Leonard Bernstein's "West Side Story." Stephan was a founding member of the contemporary Hawaiian group, Ha'ena performing as the opening act for the Makaha Sons, Amy Hanaiali’i Gilliom, and Hawaii’s award-winning group, HAPA. In Hawaii, Stephan was a featured performer at Turtle Bay Hilton's, Paakai Restaurant, located on Oahu's North Shore and was a member of the Kailua Guitar Duo with guitarist, Luke Trimble. Stephan holds a Master of Music degree in classical guitar performance studying under David Tanenbaum from the San Francisco Conservatory of Music where he served as the Guitar Graduate Teaching Assistant. For his graduate recital, Stephan performed Joaquin Rodrigo’s concerto Fantasia para un gentilhombre with a conductor and full orchestra. Stephan has also studied with Larry Ferrara, John Dearman, David Rogers, James Edwards, Joseph Thompson, and has performed in master classes for Benjamin Verdery, Scott Tenant, Jason Vieaux, Andrew York, John Dearman, Martha Masters, David Leisner, Bill Kanengiser, Rafael Cuen Garibi, Ralph Towner, and Angel Romero. A power source is requested to plug my sound system into (for events indoors where there are 10 guests or less, the guitar does not need to be amplified and does not require a power source). Thank you.